Practical SQL is an approachable and fast-paced guide to SQL (Structured Query Language), the standard programming language for defining, organizing, and exploring data in relational databases. 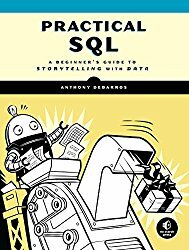 The book focuses on using SQL to find the story your data tells, with the popular open-source database PostgreSQL and the pgAdmin interface as its primary tools. You’ll first cover the fundamentals of databases and the SQL language, then build skills by analyzing data from the U.S. Census and other federal and state government agencies. With exercises and real-world examples in each chapter, this book will teach even those who have never programmed before all the tools necessary to build powerful databases and access information quickly and efficiently. You’ll learn how to: -Create databases and related tables using your own data -Define the right data types for your information -Aggregate, sort, and filter data to find patterns -Use basic math and advanced statistical functions -Identify errors in data and clean them up -Import and export data using delimited text files -Write queries for geographic information systems (GIS) -Create advanced queries and automate tasks Learning SQL doesn’t have to be dry and complicated. Practical SQL delivers clear examples with an easy-to-follow approach to teach you the tools you need to build and manage your own databases. This book uses PostgreSQL, but the SQL syntax is applicable to many database applications, including Microsoft SQL Server and MySQL.